It was the eve of Chinese New Year and like everyone else, Mary (not her real name) was leaving the office after half a day of work. But right before she stepped out of the office, her manager handed her a task and demanded it be completed by the end of the day. Mary, who had asked if her manager needed any help several times in the preceding hours without getting a response, told the manager that she needed to be home for her family reunion dinner. Her manager, who was in her late 30s, then told the human resource department about it, and the HR personnel told Mary that she’d be in trouble if she did not stay and complete the task. That was the straw that broke the camel’s back for Mary, who was then in her late 20s. She left without working on the task and resigned from her job a few days after the Chinese New Year break. Throughout her two-year stint on the job in the communication industry, she had faced similar issues. “My manager would do things like question my commitment to the job, unless I worked incredibly long hours. Deadlines were also extremely unreasonable even though I would follow up on things properly and well in advance, and as a result I had to sacrifice personal time on the weekends and during public holidays,” Mary told The Pride. “She also did a lot of overtime, but she expected everyone under her to do the same, or risk being fired or reprimanded. Belittling me and others, questioning my adequacy in front of colleagues during meetings was not uncommon. So was using her position to intimidate everyone around her. Mary also had to spend most of her weekends catching up on work, which left her with almost no social life. The ordeal, which Mary remembers vividly even though it happened about six years ago, left her traumatised. She said she would hide in the office toilet and cry several times a week. “I felt trapped because I really liked the nature of my job and absolutely loved what I was doing. I just couldn’t stand her and management in general,” Mary explained. But towards the end of her stint at the company, she started feeling depressed and angry all the time, as though she was being “sucked into this black hole”. Her predicament is somewhat similar to what Jane (not her real name), 25, is experiencing now. Jane told The Pride that what initially started out as a seemingly harmless joke about her weight and looks has since gone out of control, and has carried on for the one-and-a-half years she has spent on the job. “My director or manager would say things like ‘you need to be thin, then can get a boyfriend’ or ‘fat people tend to stay at work long and are more hardworking because they will cherish the chance of having a job’,” said Jane. She added that when she tried to seek support from her peers at work, they told her she should be able to take a harmless joke. And instead of comforting her, a female colleague, whom she thought of as a friend, told her, “I think you have depression,” while a male colleague implied that it was because of her weight that she always got rejected by guys she was interested in. She initially wanted to resign from her job in the hospitality industry, but felt it wouldn’t be nice to do so as she has just been promoted. Things have since improved slightly between her and her 41-year-old manager after she told him how she felt about his comments, but her 59-year-old director continues to make them. David Ang, director of corporate services at Human Capital Singapore, told The Pride that one reason for workplace bullying is that the bully is trying to get rid of a person from the company by targeting the person frequently. However, he added that it is also possible that a supervisor may have had a lack of training or experience on how to handle certain situations and may not be able to communicate effectively to a subordinate. “To the affected employee, they may think that they are becoming a victim of workplace bullying by their boss or supervisor,” said Ang, who also cautioned that workplace bullying is not as easy to define as compared to harassment or discrimination given the lack of existing guidelines. Dr Annabelle Chow, a clinical psychologist who runs her own practice, felt that there could be several other factors as well. The bully might have been a victim of workplace bullying previously as a junior worker and as a senior now, he feels the need to treat his juniors the same. The hectic work culture in Singapore could possibly be another contributing reason, said Dr Chow. The satisfaction gained from shaming the victim might be a key factor as well. “If you think about the playground bully as an analogy, why does the bully alway pick on the same person to push over? Because generally, the person will cry and (the bully) will feel very powerful,” said Dr Chow. Dr Chow added that the bully may not just be a supervisor or manager, but also a peer. This may come in the form of ostracising the victim as well as spreading gossip and rumours about the victim to the point that he or she feels isolated. She estimated that half of the clients she has seen have suffered workplace bullying from peers. Victims of bullying tend to be at risk of developing mental health issues such as depression, generalised anxiety disorder, relational trauma or even post traumatic stress disorder (PTSD), according to Dr Chow. “It (workplace bullying) affects their sense of value and sense of self… More often than not, at least in my clinic, we don’t see that just because you quit the job, you will just magically be better because it has already affected on deeper levels,” she said. It may also spiral out of control, to the point that their sleeping and eating patterns are affected, which in turn affect their social life and make them “find it very difficult to do things in their own life”, said Dr Chow. “It affects them continuously in different areas of life such as with friends and family, and it can also affect their intimate relationships. If they are constantly affected by their relationships, it makes it hard for them to interact with people as well,” she added. Ang, who has over 40 years of experience in human resources, suggested for victims to start gathering facts, such as specific instances when the bullying occurred. However, it has to be more than just generic statements. “If the employee can document all the instances, show that he or she is still being criticised despite doing a good piece of work, then there will be a stronger case,” said Ang, although he also warned that the employee should tread carefully. Victims of workplace bullying could speak up for themselves, but only if they have enough facts to prove their case. They can approach the HR department with the facts, or take it to the manager for an explanation. “But do so in an honest, objective way to avoid further conflict,” said Ang. But if there are still no improvements after doing so, then the employee ought to reach out to a union representative, the Ministry of Manpower, or even the Tripartite Alliance for Fair and Progressive Employment Practices. According to lawyer Josephus Tan, a good way for employees to protect themselves is to ensure that they know what is in the employment contract, and that they understand it as well. Tan also added that he would advise employees to read and understand the employment contract they have been offered, and if they need to, they should seek legal advice before signing it. Victims of bullying should seek support from friends and family, as talking to someone about your problems may help to organise your thoughts and feelings even though they might not help to solve the issue. Having such a platform “can be quite cathartic”, said Dr Chow. 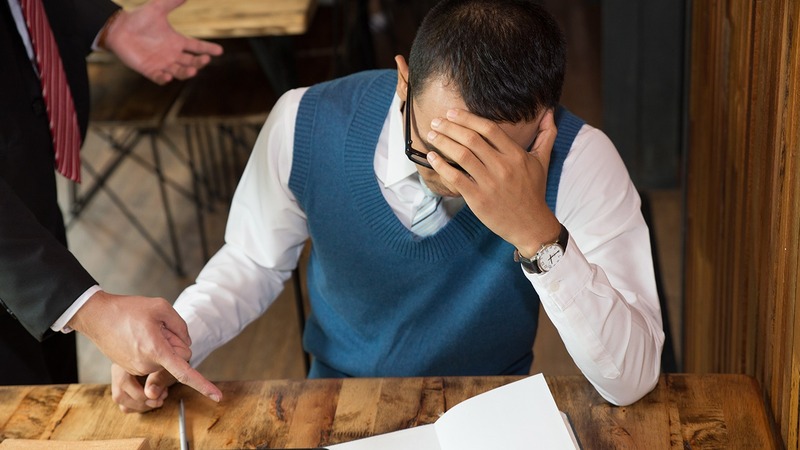 Given the potential mental health issues that could arise, victims of workplace bullying should consider seeking help from a clinical psychologist. According to Dr Chow, the most common clinical diagnosis that comes up for victims are depression and anxiety disorder and more recently, victims of workplace bullying have increasingly met the criteria for post-traumatic stress disorder too. Seeing a clinical psychologists can help victims work through these mental issues, which may have a long-lasting impact if left unchecked, warned Dr Chow. “If you are confident in yourself and you’ve given your best, you really don’t have to worry about your capability. So in this kind of situation, why suffer in silence? Just leave. The company will lose a valued person and if the manager is very incompetent and cannot manage properly, the company will be losing a lot of people,” Ang said. On the other side of the coin, if you find yourself potentially guilty of any of the bullying behaviours highlighted in this story, it’s time to reflect on the consequences of these actions. And, if you know of someone who’s being bullied at your workplace, just remember that offering a listening ear and encouraging them to confide in the relevant personnel could be an important first step to finally put a stop to the bullying.